In the infancy of Australian Football, blue was the common colour of jumpers for people to wear, and most people who worked outdoors owned a blue jumper. Blue jumpers were originally from the Channel Island of Guernsey off the coast of France. The dye did not strip the wool of it's waterproof qualities unlike other colours, and therefore was ideal in keeping footballers warm and dry in this winter sport. Jumpers were expensive, socks and caps were relatively cheap, and they were easier to dye to other colours. For example, Essendon's early guernseys were blue with a red sash, however, their socks and caps were red and black. Carlton's jumpers were never blue and yellow/orange. They were blue with white shoulder patches. Chamois was used on the shoulders as it was more comfortable to wear. However, after many washes the white dye or paint would wear off to reveal the yellow chamois underneath. 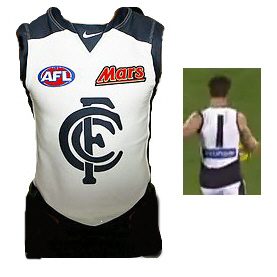 The image of the Carlton Guernsey the one-off 1900 jumper is incorrect and should be blue and white. Various Carlton guernsey styles worn in an old players match against Melbourne. This is part of a larger photo and is believed to have been taken on 8 October 1881. Former captain John Gardiner is holding the ball. Other possible players; Tom Power wearing cap to our left of Gardiner, Harry Guy to our right of Gardiner. Possibly John MacGibbon (sitting) front right. Possibly Charles Carter on the front left, although the 1881 timeline throws doubt upon it being Charles as he would have been just a 15yo in '81. See 1881 October 08 to view this team photo. Bill Casey photographed wearing the 1890-1907 lace-up in 1896 - note blue collar lining. Tommy Leydin taken from an 1888 lithograph. Image courtesy of Trevor Ruddell M.C.C. 1909 - The monogram was introduced this year. Note the differing monograms in this match, Harvey Kelly may be the player on the left. This is an enlargement of a photo which appeared in the Australasian June 19 (p35) - taken at the June 12 Round 8, 1909 v St.Kilda match. In 1909 Harvey Kelly is also photographed wearing one of these "alternative" monograms at training - see his Image Gallery. This is the monogram from the blazer worn by Carlton secretary Patrick J. Cain in 1927. Could this be the same design as Harvey Kelly's? Numbers were introduced for the 1911 final series. "Owing to similarity in uniforms of several League teams, and the consequent difficulty of distinguishing one footballer from another in close play, Carlton will have a large "C" worked on the front of their jerseys." (Referee April 07) -- The CFC monogram has been around since at least 1872 on Carlton documents. There is a CFC on Jack Donovan's 1872 illuminated address. Les Witto is pictured wearing this short-lived guernsey. To celebrate the club's 150th. anniversary a small Carlton logo was worn on the back, below the collar for this season. Players names appeared for the first time on the back on all AFL guernseys. This trial was deemed a success, and will be used four times this season before the AFL makes a permanent decision. Towards the end of 2014, the club gave the members a choice on which monograme they preferred for home and clash guernseys. The vote was overwhelming and the club reverted back to the 1927 - 1997 style monograme. The small Carlton logo near the back collar was retained. A siver/grey shadowing effect has been added to the monogramme. This was first worn in an official AFL match Round 1 March 22 against Richmond at the MCG. As it was an away match the club also wore its 'white' shorts, but in fact they are a silver/grey colour which has copped a bit of ridicule from the media and supporters alike. Carlton has said that these shorts will be worn at all away matches this season. The Union Jack was worn on the Queen's Birthday Holiday (Thursday May 24) which had coincided with the Relief of Mafeking (May 17) in South Africa during the Boer War. A double celebration. It would prove to be Queen Victoria's last birthday as she died January 22 1901, aged 81. This image is incorrect and should be blue with white shoulder patches. Jack Worrall writing in The Referee; "All the Carlton men had the Union Jack on the back of their guernseys. Perhaps they thought St.Kilda were pro-Boer." Carlton played University at Princes Park. A jumper clash created confusion for both players and spectators, until the Carlton team donned a white sash at quarter time. Carlton easily won the match. Carlton wore a white sash against Fitzroy in a club game. An early example of a clash guernsey. According to The Argus, 17 July p12; "Carlton will wear a white sash on their guernsey tomorrow, so as to prevent a clashing of uniforms with Fitzroy on a dark winters day." Both club secretaries argued which team should change their colours, to read the article click here. Carlton for their World Tour matches in London and Athens were given permission by the Australian Government to wear the nation's coat of arms on the left breast of the guernsey. Carlton wore it's "Blue Out" jumper, an almost all navy blue guernsey against Essendon at the M.C.G. It also had a navy blue CFC monograme outlined with white. Plus, hard-to-see blue numbers outlined in white. The guernsey was dedicated to the suburb of Carlton. Round 4, Carlton wore the Blue and White clash strip against St. Kilda at Wellington New Zealand. A red poppy was printed on the chest, above the AFL logo. This season after a vote by members Carlton reverted to the much loved 1927-1997 monogram on all it's jumpers. Image: Carlton captain Marc Murphy was awarded the inaugural Crowl - McDonald medal for best player on the ground. The new Carlton clash guernsey is an all white design with a slightly off white panel on the sides, it also has a blue CFC monogramme. A murky silver/grey colour with matching shorts, doing away with the 'traditional' white. The Sporting Globe September 02 1939 (p4) recalled the first time the canvas jacket was discarded for a woolen guernsey. In 1903 Wesley College went on it's first interstate trip and played in Adelaide. They played the Prince Alfred College. "The Melbourne boys wore purple woolen jerseys picked out with gold at the neck and on the sleeves. They replaced the old canvas jackets which laced in the front." Prince Alfred College and St Peter's College in Adelaide, in 1904 both adopted the woolen guernsey. That year (1904) all the Sydney Colleges playing Australian Football made the change. Carlton and Essendon were the first VFL clubs to adopt the woolen guernsey in 1908. However, as we have seen, blue woolen jumpers were the common outdoor garment in the early days of the game and preceded the canvas designs. 1864 Carlton wore an orange cap. 1865 Carlton wore a blue band on their cap. 1866 Carlton Annual Meeting, a proposal for a blue and white cap not taken up. "The orange cap, the sole insignia of a Carlton player, had been supplanted by the blue and white colours, which are now indicative of Carlton". Note: The 1868 team photo shows some players wearing caps. There looks to be a lighter band on these caps perhaps these were blue caps with a white band? 1871 April; Carlton F.C. adopted plain dark Oxford Blue as official club colour. Carlton abandoned orange cap for one of Dark Blue. 1873 At a general meeting held July 01. It was resolved that Carlton's uniform was to be blue knickerbockers (shorts or pants that ended just below the knee), long grey stockings/socks, and a blue cap. The first mention found of the Blues wearing the uniform in a game was in the Carlton-Melbourne match on July 19. 1874 Carlton abandoned the grey socks for ones of blue and white hoops. The Leader May 09 1874 mentions the uniform of blue knickerbockers, shirt and cap, blue and white striped hose. The introduction of these socks is one year earlier than previously believed. 1876 The Australasian, May 20, reported that Geelong, "...has adopted a new uniform consisting of dark blue and white striped hose and cap...", some two years after the Blues had adopted the striped or hooped socks. Is there a faint outline of a CFC monogram? The Age match report mentions the change over to Navy Blue socks was in this game. The League decided that the Home team wear black and the Away team wear white shorts. Shorts and socks Sky Blue M&M, a one off promotion. This Sunday against Collingwood, Carlton wore "clash" socks with a wide white band with blue CFC logo. Carlton now wear them for away games against Port Adelaide, St.Kilda and Collingwood. Carlton played Collingwood at the M.C.G. The Blues wore the "clash" socks, even though this Sunday match was a Carlton home game. The club was queried about this and the reply was, "It was a directive from the AFL, unfortunately we had no say in the matter." Even though this was a Carlton away match, the Blues wore their "home" plain, dark blue socks. Debut of the light blue clash guernsey, worn against St.Kilda. Light blue shorts with navy blue "clash" socks. Carlton wore it's tradtional guernsey with navy shorts against West Coast in Perth, but wore the navy blue "clash" socks. Playing Fremantle at Subiaco in Perth, Carlton wore it's current (2006-2014) navy blue jumper, shorts and socks. While the home team Fremantle wore wore its alternative "away" white with purple vees jumper, white shorts, and hooped socks. Carlton wore its traditional navy blue guernsey and orange socks against West Coast on the MCG. Carlton wore the white clash guernsey against Melbourne. The new socks were navy blue with a large white band at the top and a narrow pencil thin white band below the large one. Carlton wore its traditional Navy Blue guernsey with white shorts against Collingwood. The Navy Blue soxs with large white band on the top were worn. Carlton wore its traditional navy blue guernsey and orange socks against the Western Bulldogs on the MCG. Carlton wore its away shorts against Richmond at the MCG. These "white" shorts are infact silver and are part of the clash kit the players occasionally wear. However, the club has said that these shorts will be worn at all away games. The shorts have copped a bit of ridicule in the media and among Carlton supporters. The monogramme this year has a siver/grey shadowing, perhaps it is to match this? Contributors to this page: blueycarlton , pblue , molsey , Jarusa , Bombasheldon , camelboy and WillowBlue . Page last modified on Friday 27 of July, 2018 12:10:47 AEST by blueycarlton. 1987 - SA Rep. Side in Super Shape (27/05/87).